Among the many signs and symbols used by the Church to celebrate its faith, music is of preeminent importance. As sacred song, united to the words, it forms an integral part of solemn liturgy.-Music in Catholic Worship paragraph 23. For more information, please contact the parish office. The Adult Choir provides musical leadership usually at the 10:30 AM liturgy throughout the year from September through Pentecost. We are made up of 18-22 members providing a wide-range of choral music from Gregorian Chant to present day compositions. The Adult Choir also provides musical leadership at special times of the year such as Holy Week, the annual Day of Remembrance and the Night Mass of Christmas. If you are interested in adding your voice to the parish choir, please contact the parish office. The Resurrection choir assists the bereaved members of our faith community by providing leadership at all funerals. These wonderful volunteers give of their time to when members of our parish family are dealing with the loss of a loved one. If you are interested in lending your voice to this ensemble, please contact the parish office. The children's choir provides musical leadership at one liturgy per month from October through May. The times of liturgy vary so that the entire parish may experience leadership from the youngest members of Music Ministry. This choir is open to children from grades 1 through 5. If your child is interested in becoming a member of the children's choir, please contact the parish office. Cantors are trained singers who lead the congregation's sung-prayer in the absence of a choir. The ability to read music is very helpful and desirable. The parish cantors assist at all weekend, holiday, funeral and wedding liturgies throughout the liturgical year. For more information, please contact the parish office. Instrumentalists are welcomed at all times of the year. They add an extra level of beauty to music. We usually have instrumentalists for Christmas and the Holy Week celebrations. If you play an instrument and are interested in sharing your gift with your fellow parishioners, please contact the parish office. In addition to the primary ministries of Church and assembly at Sunday Eucharist, there are other ministries - readers, music ministers, extraordinary ministers of communion, servers, hospitality ministers (ushers/greeters), artists, etc., that are necessary to help the celebrating assembly do its job. The specific contribution of each individual ministry is unique and valuable. For more information, please contact the parish office. Extraordinary Ministers of Holy Communion share the bread and cup as well as themselves with each person who approaches them. This ministry is one of hospitable personal presence, in service, to the celebrating assembly. These ministers work hard to make the moment of communion an experience of full presence, remembering that sacraments are not things. They are personal actions of all who celebrate. For more information, please contact the parish office. As Christians we are called to preach the gospel, to praise our God and to love one another. Because of our baptism, we have both the privilege and the responsibility to minister according to our talents. All gifts are given for the good of the entire parish community. 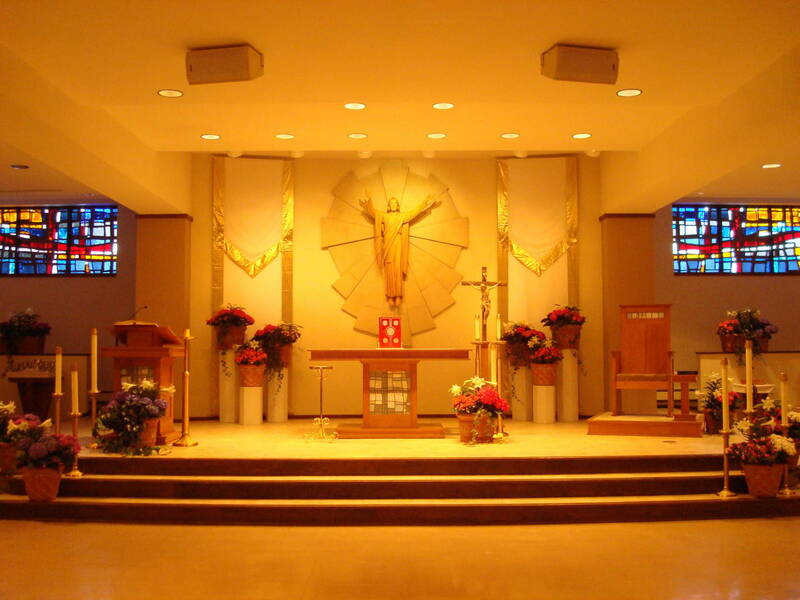 Lay people now preside at many liturgical services including: ash services, communion services, committal rites, etc. For more information, please contact the parish office. In the early years of the Church, people helped priests in many ways. Some of them helped at the celebration of the eucharist. These people were sometimes called "Acolytes." The word "Acolyte" has meant different things throughout the years. Recently it has meant the same as server. Servers assist the priest at the altar and help the congregation to pray. Serving at liturgy is open to ALL from 4th grade through adulthood. For more information, please contact the parish office. This term now is used to describe the ministry of usher/greeter. The ministry of hospitality is one of joy, hospitality and care. The most fundamental mode of Christ's presence at Liturgy is in the assembly itself. Hospitality at worship is an expression of reverence for the presence of Christ in each member of the assembly. The ministers of hospitality are called upon to set THE example of hospitality for the rest of the assembly. For more information, please contact the parish office. Saint Roman's food pantry is an outreach ministry that provides supplemental food to those people that qualify and live in one of the following zip codes: 53220, 53221 and 53207. Our pantry is staffed by 40 dedicated volunteers. Each client may visit the pantry once a month. The food we provide comes from the generous donations of our parishioners and our partnership with Hunger Task Force. For more information, please contact the parish office. Please click on the link below to see the dates that our food pantry is closed.